(Nanowerk News) Worldwide nanopositioning equipment leader PI (Physik Instrumente) has engineered and released two new compact multi-axis positioning stages based on low-profile parallel-kinematic motion devices. Driven by piezo ceramic motors, nanometer precision is achieved along with high stability based on low heat generation and a drift free auto-position-clamping feature. PI’s Multi-Axis Q-845 and N-865. This high-end system is based on proprietary PiezoWalk® linear motor technology. It provides 2 nanometer minimum incremental motion in X, Y, Z with 0.2 microradian angular motion in Pitch, YAW, and Roll. The N-865 can support loads up to 15N. Integrated proprietary linear encoders measure the position with 0.5 nanometers resolution. The Q-845 is high performance, compact 6-axis system based on piezo inertia drives, providing minimum incremental motion as small as 6 nanometers. Integrated linear encoders measure the position with 1 nanometer resolution and provide feedback to the 6-axis controller. 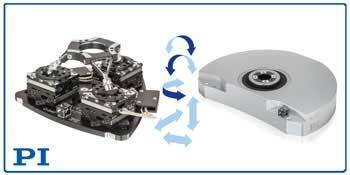 The Q-845 supports loads to 10 N and achieves velocities up to 5mm/sec. Both 6-axis systems provide software programmable virtual pivot points – a decisive feature for alignment processes such as required in SiP and micro-optics applications.